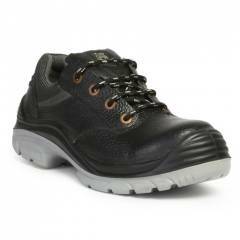 Hillson Nucleus Steel Toe Black Safety Shoes, Size: 6 is a premium quality Safety Shoes from Hillson. Moglix is a well-known ecommerce platform for qualitative range of Safety Shoes. All Hillson Nucleus Steel Toe Black Safety Shoes, Size: 6 are manufactured by using quality assured material and advanced techniques, which make them up to the standard in this highly challenging field. The materials utilized to manufacture Hillson Nucleus Steel Toe Black Safety Shoes, Size: 6, are sourced from the most reliable and official Safety Shoes vendors, chosen after performing detailed market surveys. Thus, Hillson products are widely acknowledged in the market for their high quality. We are dedicatedly involved in providing an excellent quality array of Hillson Safety Shoes. The fit and finish is good, but could be better. Otherwise, the product quality seems up to the mark, and good at this price. Your feet will feel safe for sure with this pair. Size is matching (Indian standard), best fit, light weighted, I am using it since some time and they are still as good as new. Great buy for sure!